My first collection of short stories, including the Asimov’s Reader’s Choice Award winner “Second Person, Present Tense,” and a number of stories that made year’s best lists over the years. The book also includes two never before published short stories, an introduction by Nancy Kress, and story notes. The cover is by Antonello Silverini. 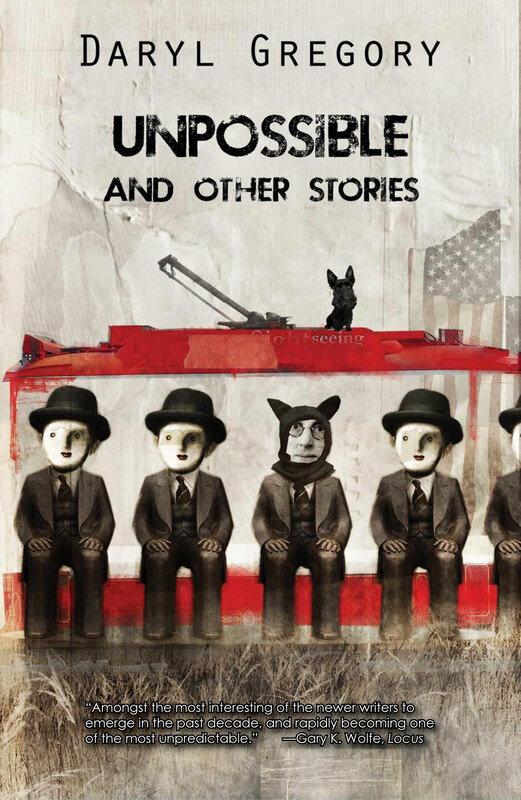 Unpossible is Gregory’s first collection. The stories are all quite short, with no time wasted on lumpy exposition or treacly morals, but each one carries all the grim weight and peculiar beauty of his novels, simmered down to a deceptively sweet syrup that goes down easy and then twists in your guts. They poke at complex, difficult notions, not so much trying to answer questions as trying to figure out how to begin asking them… These are not comfortable stories, which is a good part of what makes them worth reading. Gregory’s first collection of stories, featuring two brand new tales, is full of wonderful, unpredictable characters, from superhero sidekicks to teenagers on futuristic drugs. Largely science-fictional and fantastical, Gregory’s playful use of language and deeply human sentiments make each page a delight. Daryl Gregory has emerged as one of the most consistently interesting and yet least predicatable writers of the last decade . . . A writer of startling depth and sensitivity, whose understanding of the delicate machinations of the heart trumps his need for superheroes, or even for neurology. Daryl Gregory has found ways to explore the human mind and spirit—for good, bad, or any of the strange places between such absolutes—that seem very much his own in his first collection. “Gregory’s short fiction displays certain central obsessions—a keen understanding of cognitive sciences; an interest in families and questions of relationships and maturity; and an obsession with popular culture.” —Chris Roberson, New York Time best selling author of iZombie. I started reading this because it seemed interesting and so far, it has been thoughtful. I create ideas and dimensions in my head through your writing. I couldn’t help but think. I started watching the OA on netflix. The first few minutes made me think about Second Person, Present Tense. An outer body experience. I don’t know how to analyze this part of your book, but I like how it makes me think. Often times I ride the N Judah in the morning, and reading your writing has me thinking so much. Thank you. stumbleupon on a daily basis. It’s always helpful to read articles from oother writers and use a little something frdom other websites.